Let’s Hear it for the Stash! I’ve made a resolution to knit up as much of the yarn I already own as I can this year. I am buying a few things, but only for special projects as needed. I finished blocking the shawlette. I haven’t tried to take any good pictures of it yet. I need to do that. Davey wanted to photograph it, so I let him take a few pictures last night. The light is not so good, but he had a good time. So I needed to cast on for another easier project that I can carry around and knit on here and there when I don’t want to settle in with a pattern. Today Davey started his first Funny Bugs class. He had a great time. Miss Heather was there, so life was good. He walked up to her and gave her the biggest hug. He tends to be a little bashful, but not with Miss Heather. He loved his other teachers as well. He is a forward rolling little guy. We also learned a valuable lesson today. If if starts snowing. Go Home. Don’t drive from Littleton to Golden. It’s not a good idea. Don’t drive west into heavier snow. Especially when you are driving a Toyota which supposedly has front wheel drive but which was sliding all over the place. Especially when you have spent most of your life living somewhere where there is not much snow. It was snowing very lightly when we went to Golden to look at a house. By the time we left the house about 25 minutes later, the snow had really accumulated on the road. We made it home in one piece but it was slow going. And now it is bathtime for little Davey! He came to “Rocky Mountain High” today and had a “picnic” with me while David had a meeting. Then tumbling. Now he’s tired and it’s time for bath and books and bed! Great looking sock! I love the colors. 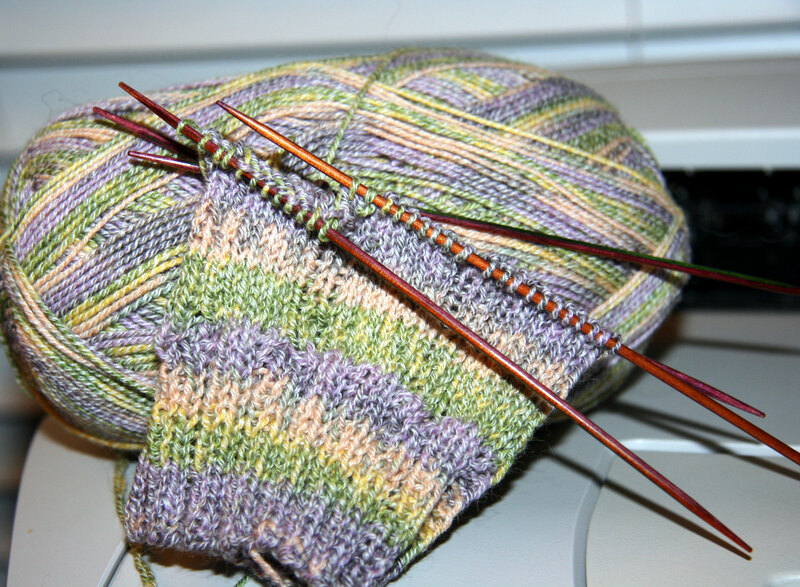 I like having an easy stockinette sock or ribbed sock on the needles to work on when I’m in the car (riding not driving) or when I have to wait. Glad you made it home safe and sound. Took us 45 minutes to get from Lakewood High to our house, which is usually less than 20. Not a good night to be out! That yarn really does look like Tofutsie. I know how a “simple” knit can be a welcome treat. 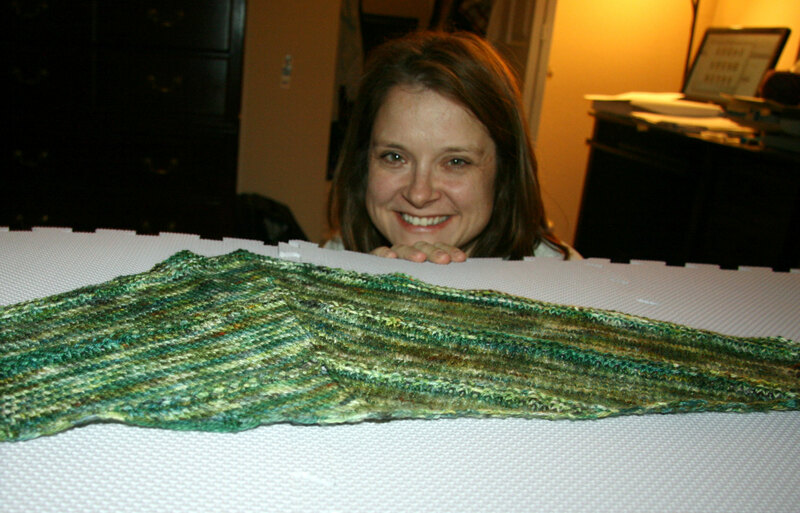 Self-striping yarn is fun! I’m trying to make substantial inroads to the stash this year, too. There’s a Ravelry group called Stashdown which gave me the idea to start a little spreadsheet hoping that I can at least balance yardage out (finished objects) with yardage in (purchases), and preferably better than that.